Ceuta and Melilla, two Spanish outposts on the Moroccan mainland, have been under Spanish control since the very end of the Crusading period. For many years, they appeared to be curiosities, vestiges of a previous age, places of no particular significance. The border as it was, on the Melilla side. Sep. 30, 2005 update: What had been a small-scale drama has grown dramatically in size and tragedy, culminating in rushes by hundreds of Africans to cross the border, leaving several dead. 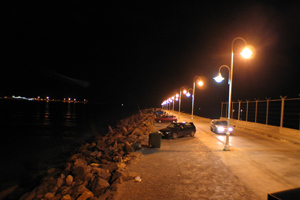 The president of Melilla, Juan José Imbroda, reports that about 15,000 sub-Saharan Africans (note: not Moroccans) attempted to smuggle themselves into Melilla in the less than two years since 2004; before that, only 350 would-be immigrants tried to do this in the six previous years. Why the upsurge? Spanish conservatives attribute it to the Zapatero government's decision in 2004 to grant amnesty to some illegal immigrants, making Spain a magnet. The government counters that it results from its success at stopping other methods of illegal immigration, such as crossing the Strait of Gibraltar in small boats. Oct. 13, 2005 update: Franco Frattini, the European Union justice commissioner, said that up to 30,000 African migrants are determined to reach Europe through Spain, dwarfing the crowds of would-be migrants waiting in the periphery of Ceuta and Melilla. "Intelligence studies suggest that around 20,000 immigrants are in Algeria determined to begin their journey to Morocco and then Ceuta and Melilla, with another 10,000 waiting in Morocco." He added that increasing the height of border fences would hardly solve the problem. And he noted new pressure on outlying EU possessions, such as the Canary Islands. The border as it is. The separatist Polisario Front movement said Friday it has located hundreds of African migrants abandoned in the Western Sahara desert by Moroccan security forces driving them out of the country. … The expellees were "completely exhausted, thirsty and hungry," the movement said in a report by its Sahrawi news agency APS, adding that they had got there "in convoys in inhuman conditions from northern Morocco". AFP has been able to follow the group since Saturday, when a Nigerian managed to slip a scrap of paper with his phone number to a photographer through the window of a bus. Since then, the man known only as George, managed to call several times to report where the bus was headed by reading off highway signs, and the bus was last heard of close to the Western Sahara. On Thursday, a Malian in the same group managed to reach AFP. "We have no water," he said. "We are going to die." Oct. 17, 2005 update: I present the problems at Ceuta and Melilla today in the context of the larger immigration issues at "Europe under Siege." Oct. 25, 2005 update: The Daily Telegraph has a dramatic story today, "Desert phone calls to the Telegraph save migrants," filling in the details about George Sunday, a Nigerian mentioned above in the Oct. 14 update, and his failing mobile phone. Dec. 29, 2005 update: The Spanish government withdrew 250 troops stationed in Melilla and Ceuta on Dec. 14 after increasing cooperation with Moroccan forces to prevent further assaults of the Spanish frontier. 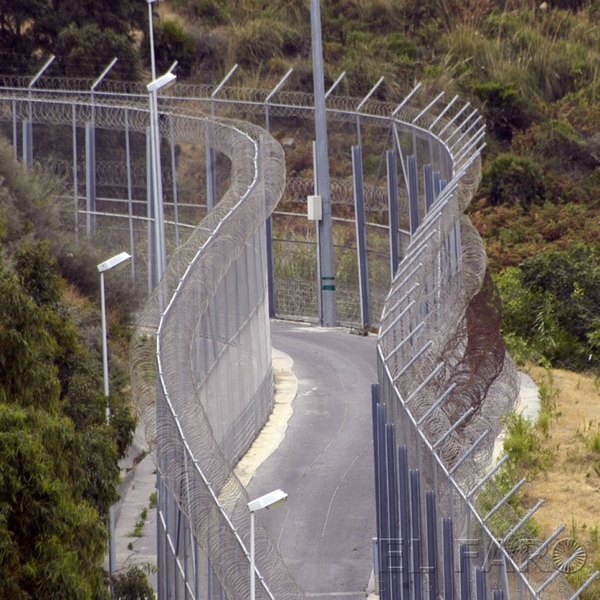 Nonetheless, seven Africans succeeded in jumping the razor-wire fence into Melilla today. They were then detained, police said. A Spanish Ministry of the Interior spokesman in Melilla, Jesus Gomez, indicated that only a scattering of migrants are these days trying to scale the fences. Meanwhile, Italy is feeling the effect of heightened security at Melilla and Ceuta. Its interior minister, Giuseppe Pisanu, said that the last two months have seen the sea-borne percentage of migrants coming from Morocco attempting to reach southern Italy jump from 2.4 percent during the period in 2004 to 32 percent in 2005. June 21, 2006 update: Elie Goldschmidt of L'Ecole des Hautes Etudes en Sciences Sociales in Paris has an informative, if tendentious, article in the Middle East Report, "Storming the Fences: Morocco and Europe's Anti-Migration Policy." July 6, 2006 update: "There are thousands of illegal [sub-Saharan Africans] migrants scattered across Morocco," said Khalid Zerouali, Morocco's top migration official at its interior ministry. "It is hard to have a precise figure as the migration is dynamic and fluctuating, but the pressure of illegal migrants is still here with us." The illegals are, in the description of a Reuters journalist, "lurking in its woods and city slums in hopes of entering Europe via a Spanish enclave." Zerouali indicated that the Moroccan government has deployed 11,000 troops to shut its sea and land borders over the past two years, and the result has been a staunching of illegal migrants by 65 percent. In the past 15 months, it has prevented more than 5,000 attempts by illegal migrants to reach Spain. The police also dismantled 484 illegal migrant smuggling networks in 2005 and 160 networks in the first three months of this year. Moroccan authorities flew home more than 2,000 migrants from Senegal, Nigeria, Mali and elsewhere in the past 11 months. Still, the tragedy unfolds. This past week alone, at least three Africans died when 70 Africans stormed Melilla, while Moroccan authorities found the bodies of 30 sub-Saharan migrants washed up on the Atlantic shore after the sinking of their small boat heading to Spain. Feb. 6, 2014 update: At least seven migrants drowned today as around 200 would-be illegal immigrants swam from a beach in Morocco to Ceuta, braving the strong currents of the Strait of Gibraltar. Moroccan coastguard vessels picked up 150 of the migrants and the remainder, other than those who drowned, returned to Morocco. They make up a small percentage of the estimated 30,000 illegal immigrants in Morocco awaiting their chance to get to Europe. Mar. 30, 2014 update: In "A Borderline Where Women Bear the Weight" by Suzanne Daley, we learn of another bizarre and cruel aspect of the Spanish-Morocco boundary in Africa, which this article calls perhaps the most "abrupt economic fault line in the world [where] just a few rows of chain link and barbed wire separate the wealth of Europe from the despair of Africa." For obscure bureaucratic reasons, so long as goods are carried manually from Melilla to Morocco, no import taxes are imposed, leading to a €300 million annual trade of used clothing, toilet paper, small electronics, and the like across a quarter-mile stretch. Even more oddly, it tends to be "mule ladies" who labor under enormous loads – except when they are brushed aside by young men – to earn the €3 to €10 per trip. By 10 a.m. one recent day, Zahra Kechache, 65, who has carried packages for more than a decade, was having an asthma attack. Nora el-Koukhou, 39, who has five children and a husband in jail, was crying after being crushed between bales in the corridor leading to the border turnstiles. One woman was lying in a ditch wailing, blood trickling from her head. "The men make this impossible," said Mrs. Rmamda, who has four children and a blind husband to feed. "This job is so dangerous now. I'm afraid I will break an arm or a leg in there."